Congratulations to everyone who ran, and thanks to everyone who came out for a record turnout of 528 people. These new Delegates will attend the annual Democrats Convention, network with other Democrats, elect Party officers, promote the California Democratic Party agenda, endorse candidates for statewide, legislative and congressional office, and vote to endorse resolutions and ballot measures all doing so while representing Assembly District 68. 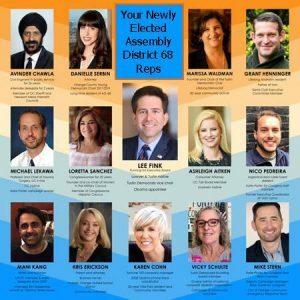 Congratulations to: Loretta Sanchez , Ashleigh Aitken, Kris Erickson , Vicky Shulte, Karen Cohn, Danielle Serbin, Marissa Waldman, Lee Fink, Mani Kang, Mike Stern, Nicholas Pedreira, Michael Lekawa, Avinder Chawla and Grant Henninger. Lee Fink was elected the Representative to the Executive Board.